Diario Judío México - According to Google, the definition of the word, “Upstander” is someone who recognizes when something is wrong and acts to make it right. When we stand up for what is right, and do our best to help support and protect someone who is being hurt, we are being socially responsible. For the Butterfly Project, those are words to live by. The Butterfly Project or Zikaron V’ Tikvah, is a non-profit organization, co-founded by an artist and an educator. Cheryl Rattner-Price and Jan Landau, respectively, use art and education to remind and teach others, especially students, about Holocaust remembrance and the horrible tragedy that hatred and intolerance produced. They want to teach these lessons in all schools, not just Jewish ones, which can lead to healing discussions about anti-Semitism, racism, and bullying. This is an important message in today’s environment. In addition, those under 25 might not know much about the Holocaust and this specific time in history. This non-profit is called the Butterfly Project because rather than deliver the lesson in a dry, conventional lecture, it is brought alive by painting ceramic butterflies. The lessons are also made more relevant to the students by having actual survivors or children of survivors come and talk. For example, Sonia Fox- Ohlbaum, part of the education team, often shows the camp prison clothing that her father wore. It is a way of making the abstract more concrete and real. Finally, there is something symbolic about a ceramic butterfly going through fire and being reborn. This is the kind of experience that stays with you. 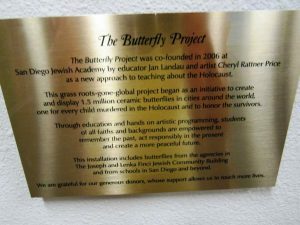 There are some beautiful butterfly installations in various locations, including San Diego Jewish Academy, along with many local schools and synagogues. Rattner-Price and Landau created the Butterfly Project after being inspired by “The Paper Clips Project”. Students in Whitwell, Tennessee collected over six million paper clips to represent and honor the six million Jewish victims of the Holocaust. The Butterfly Project wants to memorialize the 1.5 million children who perished in the Holocaust by having students of all ages paint ceramic butterflies. As Rattner-Price says, “the sweet spot is middle school students for that is a good age for them to learn”. The goal is to paint 1.5 million butterflies. So far, they have visited classrooms in many parts of the United States and around the world, including Canada, Mexico, Israel, Australia, France, Tanzania, Cuba, Morocco, and Poland. They have also been to almost every synagogue in San Diego. They want to permanently display the painted butterflies as symbols of resilience and hope. On their website, they say that the project drew on inspiration not only from the Paper Clips project, but also from The Diary of Anne Frank and especially from the haunting poem, “The Butterfly” written by Pavel Friedmann while he was in Theresienstadt or the Czech ghetto of Terezin. As he said in the last line, “Butterflies don’t live here in the Ghetto”. He died on April 6th, 1942. For Rattner-Price, who came to San Diego from the east coast in 1998, the Butterfly Project is now her life’s work. While living in New Jersey and New York, she had her own business and later opened up a studio where she created ceramics, tiles and mosaics. Although she was successful, it had been her dream since she was 15 to move out west. She arrived in San Diego in March 1998 with her one year old daughter and then husband, Michael Price. They had another daughter here. Rattner-Price is very proud of her daughters Emily, who is now 21, and Julia who is 18. The girls went to the San Diego Jewish Academy. The Butterfly Project began at the SDJA. She helped them to create a very large, free standing menorah –part of community work- on campus that represented the seven values of the school. It was art with a message. She then teamed up with former SDJA principal, Landau, and the Butterfly Project, more art with a message, was born. The project has since grown and now includes three members on the staff headed by Rattner-Price, four members on the education team headed by Landau, and eight members on the Board of Directors. Together, they have made the Butterfly Project more successful in getting an important message out there, and they continue to grow as they build larger networks.